Regardless of your fly fishing prowess, these flies should be in your fly box while you’re on the river for trout. For many beginners, dry flies offer a good alternative to nymphing as you will likely be able to watch your fly as it drifts downstream. More advanced fly fishermen will often turn to a dry fly setup depending on time of day, fish surfacing, or simply to mix things up. One strategy I really like for small streams is a hatch based fly (see, how to identify a fly hatch) dry fly above a tiny, tiny nymph. This will allow you to work the far bank and essentially kill two birds with one stone. It’s tricky, but can be done quite effectively even at the beginner level. Enough about strategy and technique. One of the keys behind this list is this: which flies, if we take 5 random fly fishermen and inspect their boxes, are almost guaranteed to be in there? 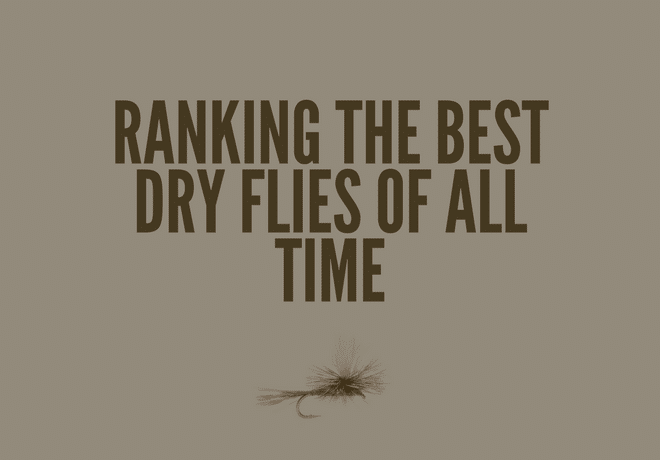 Keep in mind, depending upon which part of the world you’re fishing in, these flies may vary. However, for the sake of our list, we’re taking a fly fishermen who fishes trout largely in the United States or Western United States. Mayflies are just about everywhere, which is why certain patterns remain so popular (even after decades). Thinking about building a fly box? Make sure you’ve got these flies in it. The Parachute Adams is one of the most popular dry flies of all time. The original Adams fly dates back to 1922, with the “parachute” coming on much later. 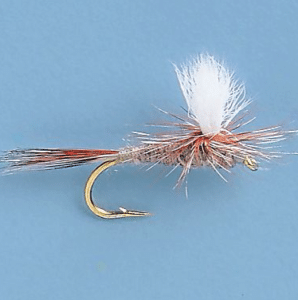 The parachute portion of the fly helps the fly land upright on nearly every cast in addition to giving the fly fisherman a much clearer view of the fly. For an alternative to the Parachute Adams (and a fly to use closer to dark or in moving water), I like the hi-visibility parachute in a size 18-22. In addition, this fly also works wonders behind an ant on slow days. Buy on Amazon, Cabela’s.com, or Orvis.com. 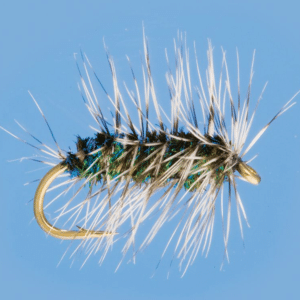 The Elk Hair Caddis fly imitates a caddisfly (weird, isn’t it) and comes in at number two on this list simply because it catches fish. 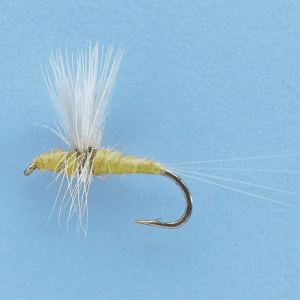 While other positions could easily interchange within each other, the Parachute and Elk Hair Caddis at number 1 and 2 is a staple. Personally, I like the elk hair caddis in a dark or tan however it does come in varying colors to imiate different caddis/small stoneflies. Use it across the U.S and find me a fly fisherman that doesn’t have this pattern in their box (hint: they do not exist). Add several different sizes to your box, it’s easy for beginner fishermen to get caught up with bigger flies, leading to less fish in certain situations. The definition of “attractor” flies for when there is no hatch, the Stimulator fly is a great locator for trout. They work extremely well during large stonefly/salmon fly hatches and product trout. It’s pretty easy to get caught up on which fly you should use on the river, which is one of the reasons the Stimulator is a favorite among anglers. The stimulator fly pattern just has a “bugginess” about it and trout love bugginess. Do not waste time stressing out about colors on the stimulator pattern, grab one or two of a couple different colors and try them as slump busters. The Pale Morning Dun (or, Mayfly Species Ephemerella excrucians) can be found throughout the United States, which is one of the reasons it’s such a favorite among fly fishermen. It would be a good idea to get a hold of hatch charts for your location prior to fishing and make sure you’ve got several different sizes of the PMD in your box. Pale Morning Duns, commonly referred to as PMD’s can vary slightly in color across the United States. 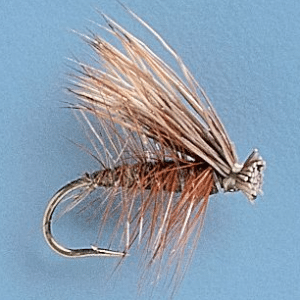 While not as popular as the Elk Hair Caddis or the Parachute Adams, I love the Griffith’s Gnat for a couple reasons. First, it’s versatility. Use this fly in Michigan’s Upper Peninsula going after Brook Trout, or bring it to Colorado when you need a change of pace. Second, for a beginner fly tying aficionado, this is an excellent starter fly. 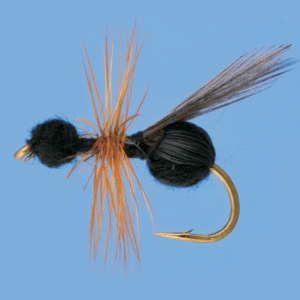 This fly get’s its name from George Griffith, the home in which Trout Unlimited was formed way back in 1959. 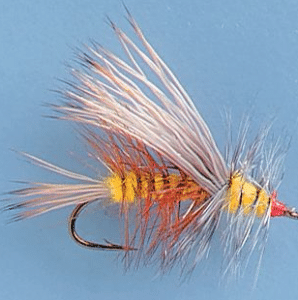 The Rusty Spinner is a prolific hatcher that rides the water for a long time prior to taking flight, making it a great addition to any fly box. This may be the least talked about fly on this list, but’s an important one simply due to it’s fish catching ability. 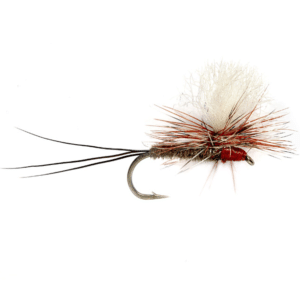 Add this fly to your box, you’ll be glad you did. This fly can (depending upon how it’s tied) closely resemble a Parachute minus the legs. 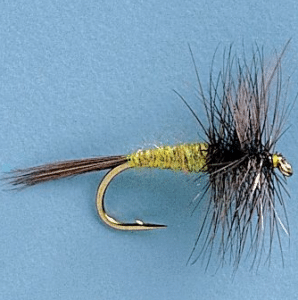 Trim a little hackle from the bottom of this fly to make it float closer to the water during late season trout trips (when the Blue Winged Olive is popular). The Blue Winged Olive (Genus Baetis) hatches well as long as the water temperature is above 40 degrees Fahrenheit, on dismal days. While it may look like a Pale Morning Dun, the biggest difference is quite obviously the Blue Wings. If you’re on the river with just about every fly in your box failing, try an ant. There isn’t much more you need to know about the ant and truthfully, many anglers won’t use them. The bottom line is, ants are everywhere. Use an ant above a Parachute or an Ant above a small Copper John for a deadly combo when the fish just don’t seem to be biting. Plus, it’s an easy tie for beginners. Lastly, ants come in a variety of variations, foam body or non (as shown here), pick something you like and go with it. Do I need all of these flies be in my box? When you’re building a fly box for trout, it can be quite easy to get carried away. Whether you choose flies from this website or others, remember to visit a local fly shop prior to hitting the river. I might keep 4+ ants in my box where as I’ll have 10+ Elk Hair Caddis. Establish a nice base of some of the more popular patterns (they’re popular for a reason, because they flat out catch fish) and take 3-5 patterns from a local shop for a successful trip on the river.